The 3-Day Solution Plan was created by Laurel Mellin, a weight loss expert, associate clinical professor of family and community medicine at the University of California, and New York Times bestselling author of The Pathway. This program was named one of the top medical advances of 2000 by Health magazine and offers a proven step-by-step plan for losing weight without dieting by turning off the drive to overeat – in just three days. The premise of the 3-Day Solution Plan is that by directly addressing the “feeling brain” we can learn to overcome primitive urges such as the desire to overeat. Most other weight loss programs are based on knowledge and planning but “reason can’t make anyone stop wanting a cookie”. During your 3-day solution you must do something that is not easy, but is rewarding for you, for six to eight hours a day. The idea is that we have an inbuilt need to work and by becoming actively engaged in meaningful pursuits our neurotransmitter production becomes more beneficial. What you do during the day is reflected in your appetite. If you feel deprived or unsatisfied in your work you may feel the need to overeat to compensate. Conversely, if you are rewarded without putting in the work this can reflect as an attitude of indulgence. Laurel Mellin says the easiest part of the plan is the eating and the book includes menu plans that are fast, easy and nutritious. Each day you have three main meals and a morning and afternoon snack that total between 1200 and 1400 calories. Your evening snack will not be food but instead is devoted to restoration and intimacy. You are instructed to eat only when you are hungry and stop eating when you are just satisfied. Also, you should base your diet around the healthy foods that you enjoy and only consume the less healthful foods if you really need them. If you do choose to indulge you should avoid feeling guilty and enjoy every mouthful. Each day of the 3-Day Solution Plan has very specific instructions and goals. The first day, Detox, is designed to cleanse your body and start to retrain your “feeling brain”. Day two, Connection, brings you an abundance of positive feelings so that the desire to overeat is reduced. The third day, Vibrancy, helps to create a sense of awakening that will set you up to continue with a less intense version of the plan as a long-term approach to healthy weight loss. Fruit, vegetables, low-fat milk, feta cheese, eggs, chicken, shrimp, salmon, cashews, almonds, whole grain pasta, whole grain cereal, legumes, dark chocolate, olive oil, herbal tea. Unless you have health problems you will exercise for an hour each day while completing The 3 Day Solution Plan. The first day you do something that is either in nature or involves listening to music. On the second day, you do an activity that helps you connect with yourself or someone else like yoga, dancing, walking, or playing a team sport. The last day involves exercise in the form of pure play. You may go horseback riding, hiking, dance around your house or dig in the garden. 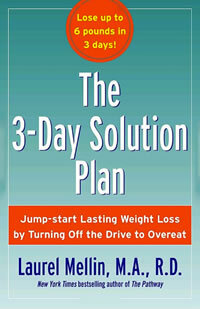 The 3-Day Solution Plan: Jump-start Lasting Weight Loss by Turning Off the Drive to Overeat retails at $24.95. Produces fast results in regards to appetite regulation. Provides suggestions for easy restaurant substitutions. Addresses the importance of work satisfaction, relationships and stress management as part of a complete approach to health and weight management. The 3 Day Solution Plan is proven to be effective for weight loss in two- and six-year follow-up studies. Many dieters won’t have the option to do rewarding activities for six hours a day due to their current work obligations. Diet plan is highly structured and restrictive. Caffeine and alcohol are only permitted very occasionally. The 3-Day Solution Plan is designed to reprogram the “feeling brain” so that you will start to automatically make healthier choices. Unfortunately the program requires a very large time investment that will be beyond the capability of most dieters. However, many can benefit from the practical skills and techniques outlined in this book to reduce stress and the associated emotional eating.